Update – Oct 26, 2011: Exactly 2 years after the initial Sarnafil PVC Roof repair (read details below) I went back to that roof. This time, there were 17 new holes in the roof. I repaired it once again with IB PVC flat roofing material. Check out the full review of this latest PVC roof repair in Needham MA. Update 2: a Trocal roof repair also reviewed below – a section of that roof has completely shattered over the past winter, and we had replaced it with an IB PVC Flat Roof in the spring of 2011. PVC roofing is one of the longest lasting flat roof membrane systems, and most PVC roofs installed, will last in excess of 25-30 years. PVC roofing utilizes Hot-Air welding of the seams, which allows the roof to remain watertight for many years, as there is no adhesive to fail ( as is the case with EPDM rubber roofing ). Still, even PVC roofs can leak. Sometimes because of poor installation, and sometimes because of physical damage to the roofing membrane. 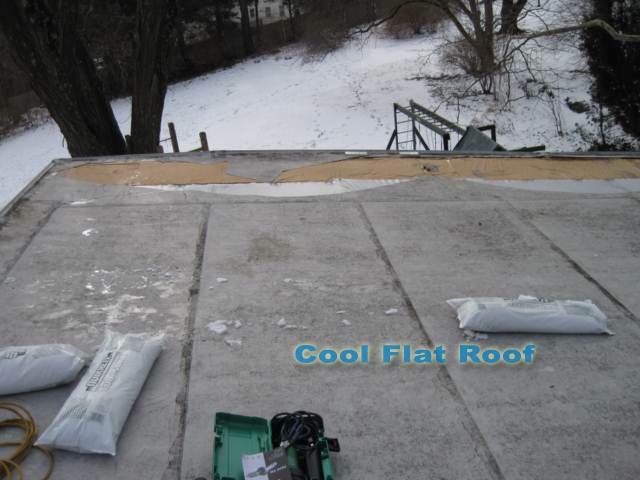 You may have heard about the Trocal PVC roof failures, which was the only major case of PVC roof failures (below we will explain how Trocal roofs failed). In this article we will discuss and demonstrate the PVC roof leaks and repair procedure, based on two recent repairs we have done. First, please note that even if your PVC roof leaks – you should not be too worried – PVC roofs are rather easy to repair, and you will rarely need to replace your entire roof. As promised – a quick look into why Trocal PVC roofs failed on a massive scale, forcing the company to be sold to another large roofing materials manufacturer. Trocal PVC roofing was one of the first commercially available PVC roofs in the US, and they worked great at first. But they had one major drawback – they were unreinforced (today, most PVC membranes are reinforced with polyester scrim sitting between the top and bottom ply of the membrane). When the ambient temperatures were below freezing, a Trocal roof could crack or shatter if you simply stepped on it. Later, all PVC manufacturers switched to reinforced membrane, and some would add special chemicals to increase the elasticity of the membrane. Today, unreinforced PVC membrane is used only for flashing accessories such as inside / outside corners, pipe flashing, etc. This Trocal roof sustained damage from a falling tree branch in December of 2009, and cracked along the edge. Although the roof was over 20 years old, it was still fully weldable and we were able to repair it with a new IB PVC roofing membrane in Jan. 2010. We removed the damaged section of the roof, cleaned the surface with MEK solution, installed new PVC coated IB Drip Edge metal, and welded a 50-mil white IB roofing membrane. The repair was performed in a 25 degrees outside temperature, so we had to take special care not to damage the rest of the original roof. As you can see in the video, the section of the roof we had to repair sustained serious damage, when the tree branch fell on the roof, and yet, because the material was still pliable, we easily welded a new IB membrane to it, extending the service life of this roof at a rather low cost, compared to flat roof price to installing a new IB roof over the entire house. The repair of this PVC roof took place in November of 2009. That day, we actually went out to work on 3 roof repair service calls – two of them for a rubber roof repair, and the last one to fix a leak in a 20 years old Sarnafil PVC roof. The original roof was installed by a roofing contractor for a friend, and then the new owner of the house called us to fix the leak, which we had to find first. The roof leak turned out to be caused by physical damage to the roof – apparently the carpenters who were replacing rotten fascia boards, dropped sharp tools onto the roof, and left, without telling the homeowner about the damage. We had to sweep all the leaves off the roof to find the damage. The first thing I did was to confirm that the roof was in fact PVC material, and test how the new IB roof will weld to the 20 years old membrane. I performed the test weld on the sloped section of the roof, to avoid potential leaks if the weld was unsuccessful. The test weld went well, and it was now time to do the actual repair. I should note that the 20 years old membrane lost most of its flexibility over time and was very “hard”. Also, the surface of the roof collected a lot of dirt, and required extensive cleaning with acetone (acetone does not affect or damage PVC membrane, like most oil based cleaners do, and is safe to use on a PVC roof). After the prep work was done, it was time to weld the patch over the damaged area. I had to set the welder temperature higher than normal to get a better weld between the 20 year old material and the new patch. One thing I noticed when welding the patch, was a massive amount of tiny blisters popping up on the old roof. Still the two materials welded together just fine and after a probe test of the seam, the repair was complete. It took about two hours to complete this repair, including finding the source of the leak, cleaning the roof surface and installing the patch. Because this repair was the last one of the day, it was already dark, when I finished installing the patch. As you can see from the two examples above, PVC roofs last a very long time, and even if you have a leak, the membrane can be easily fixed, using a new patch, at a rather fair price, extending the service life of your roof. Most PVC roofs can be fixed, unless there are some serious installation or material defects. Unlike rubber roofing materials, there is no glue involved in the repair process, and the patch will stay on as long as your roof lasts. 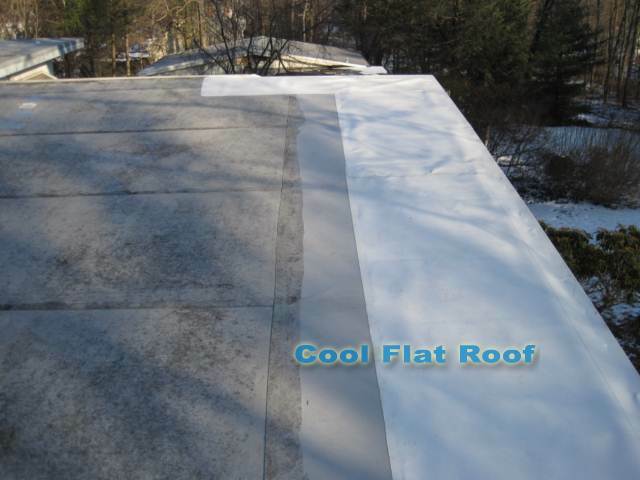 If your flat roof leaks, be it a PVC or a Rubber roof, and you are located in Massachusetts, Connecticut or Rhode Island, we can repair it, or install a new IB PVC roof – fill out the roof estimate form and get a free price quote. You can also use our interactive roofing calculator to estimate Flat Roof replacement cost, as well as Metal Roofing installation prices. 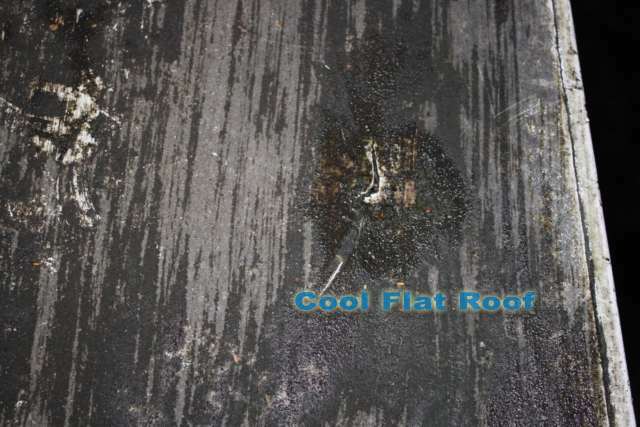 Hello, I have a CPA roof, 18 years old, and it appears to have some leaks between where the roof material ends and the gutter or gutter cap begins. Can this be effectively repaired using a ‘premium elastomeric sealant’? Wanted to know what caulk would be best to use on perimeter clips on my residential flat roof made of PVC. The roof is about 20 years old and I was told I needed to apply caulk to any small holes/or cracking on these areas. Really need pro advice here PLEASE! I’ve been using Solar Seal 900 exclusively, for over 10 years – it’s excellent roof sealant. In fact, IB Roofs, sells it to contractors as “default” sealant for their product. You can buy it for $6.25 per tube on Amazon. You will probably need a few tubes. Before you apply this caulk, wash the surface with warm water to remove the dirt. If needed you can also use acetone to clean PVC, but that may be overkill. Don’t use any other chemical cleaners! Good luck – let me know how it worked out for you. Xunlight also has a Chinese operation, and to be honest, I don’t know who owns who, and where the parent company is…. The original Trocal Roofing was solvent welded. We used a brush and dragged a sand bag over the lap as there were no rubber rollers. They later came out with a robot that had a brush mounted on the front and a copper tube to feed the solvent to the brush. The carriage was mounted on floor brushes and weighted down. You pushed it along the lap. I thought most of the failures were from the product not being light safe causing plasticizer migration. This caused the membrane to become brittle. how to repair leaking welds? I just covered my 200 sq. meters flat roof with Sika mechanically fastened PVC ply. Now i have leaks all over the place, and all I can think off is poorly welded lines. The screwdriver test does show no problem, welds look strong and homogeneous. Here in Lithuania we have no specialists, so I did this myself. I have a Leister heat gun, and various tips for it. What is the easiest/most right way of fixing this? Appreciate your help very much. Great job on the Sarnafil patch. I am the service mananger for a large flat roofing/sheet metal company in Northern Michigan. We use to carry Trocal years ago, but do to its shrinking tendencies we switched brands and have been with Sarnafil for 18 yrs. We also carry IB systems on our residentail projects. I find it interesting up here when I or one of my techs goes to do a repair on Trocal and some of the roofs are causing great structual damage and others look like they were put on 4-5 years ago. I find the less direct sunlight to the Trocal the greater the life. Again, this is just a observation. Sarnafil makes a great product and has proven, time tested longevity. the trocal roof looks at least 25 years old to me and that is common with trocal as the guarantee if 20-25years, as trocal expands and contracts with temperature. also your fixings pattern on metal and laps is not what trocal require. should be a fixing at least every 150mm on metal and laps. why were you cleaning sarnafil with acetone when sarna sell a cleaner of their own. there also doesnt seem to be any lap paste/seam sealer on the trocal another requirement. By fixing pattern you mean screw and plate placement – correct? If so, we place fasteners every foot (~ 27 cm), which is the fastener pattern of IB roof, which we install primarily. Also, Trocal is no more and finding their installation specs is next to impossible, and frankly not necessary. Most PVC roof are more or less similar in installation. Also, we have completely replaced that roof this spring, as another branch fell on it and shattered the rest of the roof. Sarnafil roof and acetone. I did not know what the roof manufacturer was until I got up on that roof. All I knew what that it is a PVC roof, as the homeowner was unaware of the material specs (they bough the house with that roof). Acetone is a universal cleaner that is PVC safe, and that is why we use it. Also Sarnafil will not sell to contractors who are not certified and we do not want to work with them, hence we cannot get their cleaner. 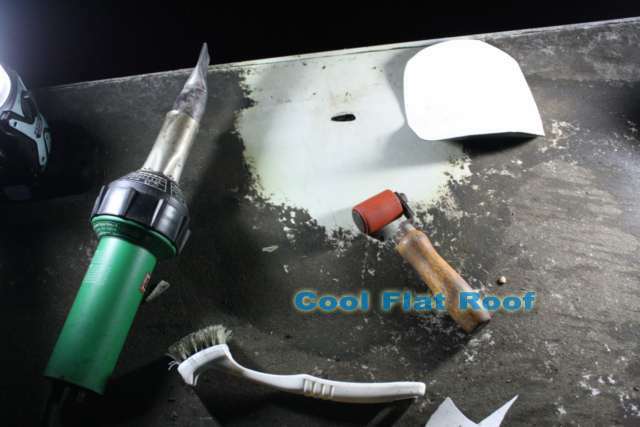 As far as lap caulk – not only it is not necessary for IB roofs, as IB uses non-wicking scrim in their PVC roof, it is also an issue if there needs to be any additional work done, because sealant will melt and prevent good welding. 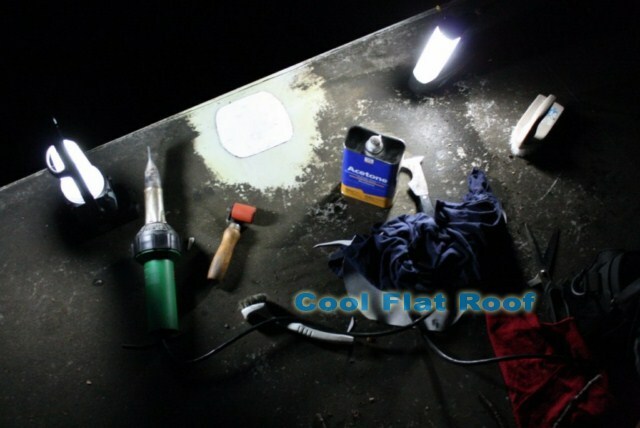 Lap sealant is only used on low grade single ply roofs, such as TPO, because of wicking scrim and potential for bad welds, as well as rubber roofs, where seams tend to fail all the time… well rubber roof lap sealant also fails, even before the seams do … Neither Saranfil, IB roofs, Duralast, etc., use lap sealant. PVC roofing is awesome especially when there are so many materials out there that allow water to leak right into the house causing extensive water damage. Thanks do much for sharing this information. You are partially correct, but you omit details which can create confusion. IB, although does not manufacture the product, is a “developer”, and is using Canadian General (CA) as contract manufacturer. The way you present it, it sounds like IB is merely a private label ( like Jones Manville which sells Cooley membrane). IB develops the formulation and gives CA the specs to which to manufacture the product. This is much like nVidia (huge graphics chipset maker) and even Intel (to a much lesser degree) order their chips to be made by TSMC. This is rather common when a company hires contract manufacturer to make product, but is different from private labeling, when you only put your name on a product. I’ve been in single ply roofing since 1982 and PVC, although it is an excellent polymer, has had more problems than almost any other membrane type. PVC is only the base polymer and many other additives in the formulation will determine the longterm outcome of the material, as will the density and type of reinforcement used in the product. IB, is not a manufacturer, they only market a product from Canada from Canadian General, so that is troublesome for me. I know the membrane is very good, but many other issues have to be considered when purchasing a roof system. Interesting pic of the old Trocal Roof. I was a Regional Manager for them up to the sale to JM. The roof you repaired must be very old, I can tell by the baby blue seam caulk. We stopped using it maybe 25 years ago. I can tell you also that the company was not sold because of shatters, we had a handle on them and had switched to reinforced membranes. There was a whole lot of shatters of the German unreinforced product. Mostly ballasted membranes, but later the MA membranes started to go. I would like ti know a bit more about Trocal and what happened to it / why it was sold off. I was not involved in the roofing business back then as I was a little young … The info you can find today is all official press releases … And I would want to know the actual story in details. Maybe you could write a little blog post about trocal – I’m sure our readers will find it very interesting. Some roof installation work may be undertaken by our independent partners, who are also licensed and certified to install IB Roof Systems, and Metal Roofs in Massachusetts, Connecticut and Rhode Island. Content of this site may not be reproduced without our permission. For personal use only. Copyright - CoolFlatRoof.com - 2016. All rights reserved. Any Questions? Contact CoolFlatRoof.